Life’s tasks don’t stop when you’re on the road. Now, Siri Eyes-Free helps you stay connected and up to date even when in your Lexus. And it does it all through a conversation. Siri® is a feature of Apple’s iOS™1. It is a “personal digital assistant” that responds to your spoken commands to place phone calls, set appointments, take dictation, answer certain types of questions (e.g., “What is the weather forecast?”) and more. Siri responds using a female voice so, in common usage, the name Siri refers both to the feature and the “person” behind the voice. Siri is on Apple iPhone® 4S and 5; Siri is also on select iPad® and iPod touch® models, but those cannot be used to place phone calls. Siri Eyes-Free is a special mode designed for in-vehicle use. In Eyes-Free, you interact with Siri using the vehicle’s microphone and speakers, not those on the phone. With the exception of navigation, the phone screen stays dark—there’s nothing on the phone to look at or be distracted by, hence the name “Eyes-Free.” When in this mode, some of Siri’s capabilities are modified or blocked to help reduce the distraction of in-vehicle use. How do I set up and operate Siri Eyes-Free? A Lexus with Siri Eyes-Free capability. An iPhone 4S or 5 running iOS 6. Siri and Bluetooth® 2 turned on. On the phone, tap Settings > General > Siri and make sure the “My Info” setting links to your contact information. This enables you to make requests like, “Take me home” and have Siri know where your home is. Pair the phone to the vehicle using Bluetooth. Operate Siri Eyes-Free by pressing the steering wheel’s off-hook switch for about two seconds. Once you hear two quick bell-like tones, say what you want to do. Siri Eyes-Free will prompt you for any information it needs to complete your task. What can Siri Eyes-Free do? Place phone calls, and dictate text messages and emails. Read incoming text messages over the vehicle’s speakers. Set reminders, appointments, alarms and timers. Hear weather reports, stock prices and sport scores. 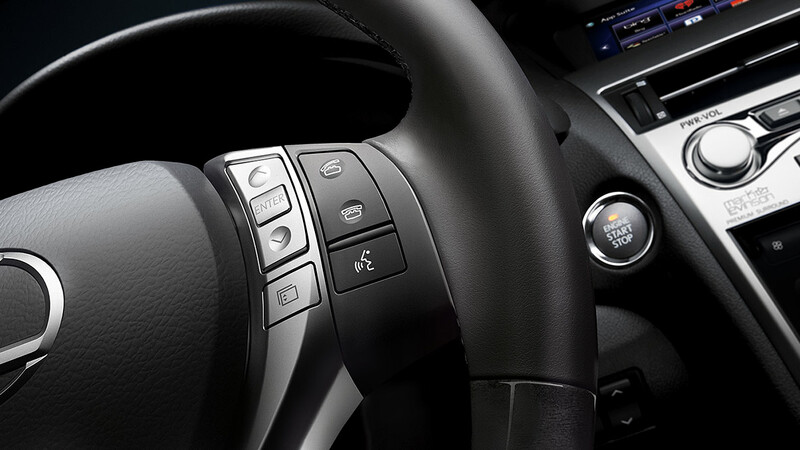 Control the phone’s iTunes® library (music will play over the vehicle’s speakers). Find points of interest, such as nearby coffeehouses or restaurants. To help reduce distraction, use Siri’s spoken directions instead of looking at the phone’s map display. What are some limits to Siri Eyes-Free? Ask something that would require showing the answer on a Web page. Why is Siri Eyes-Free important? Survey after survey shows that drivers want and expect to stay connected to their electronic worlds even when on the road. Siri Eyes-Free is a dramatic next step to bring that connectedness into the vehicle. One of Siri’s big advantages is that it doesn’t require much training: if you can use Siri on your iPhone, you can use Siri Eyes-Free in your Lexus. In short, it provides connectedness in a familiar way that fits into your life—which is a compelling sales story. Which Lexus models have Siri Eyes-Free? Siri Eyes-Free is a feature of Display Audio and navigation systems on MY2014 ES, GS, LS and RX models, all beginning with August 2013 production. How does Siri Eyes-Free interact with the vehicle’s onboard electronics? Generally, the two systems don’t interact. For example, Siri Eyes-Free navigation uses Apple Maps and routing, not the vehicle’s built-in navigation system (if equipped). Think of Siri Eyes-Free as a layer on top of the vehicle’s electronics. When invoked, Siri Eyes-Free pauses the existing media (e.g., satellite radio); after Siri Eyes-Free has completed its task, the media resumes playback. There is one exception. Asking Siri Eyes-Free to play music from the phone’s iTunes library will cause the vehicle’s audio source to switch from the currently playing media to Bluetooth audio, enabling iTunes playback.